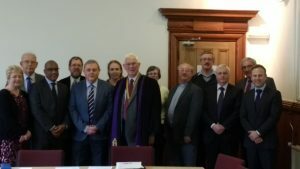 The Free Church Council for Wales includes representatives of the Union of Welsh Independents, the Baptist Union of Wales, the Baptist Union of Great Britain, the Presbyterian Church of Wales, the United Reformed Church in Wales, the Congregational Federation in Wales, the Methodist Church in Wales the Salvation Army in Wales and the German-speaking Lutheran, Reformed and United Congregations in Wales. In total, these denominations have about 65,000 adult members in 1,600 churches throughout Wales, worshipping in Welsh and English. At its meeting on May 16th 2017 Mr. Rheinallt Thomas was installed as President for the next three years. The ceremony was led by the current President, Rev. Peter Dewi Richards, and in introducing Mr. Thomas he noted several facts about background: that he had been an elder of the Presbyterian Church of Wales since 1966; a Past President of the Presbyterian Association in the North; the North Wales Free Church Council and the Anglesey Presbytery . He noted that he had been responsible for the Education Affairs of Free Church Council of Wales for 16 years and also that he was (founder) Director of the Welsh National Centre for Religious Education for 21 years. After the enrobing of new President and presenting him with the chain of office a prayer was offered by a former President of the Council Rev Gareth Morgan Jones. The new President thanked the Rev. 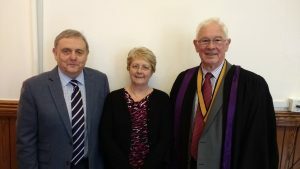 Peter Dewi Richards for his wise but firm leadership at meetings of the Council over the past three years and as a former Secretary to the Council he had been able to bring a lot of experience to the post. He was also thanked for representing us nationally both in the public and church circles. The President went on to thank for the honour bestowed on him and trusted that he would fullfil the requirements of the post with the same rigor and effectiveness as his predecessors. He knew that he was the first layman to be President in the North in 2002 and to his knowledge the only other lay president of the National Council was Judge David Watckin Powell a considerable number of years ago.